The Regular Season in IBL is slowly approaching the end. But there may be still some important changes in the final standings in the last 3 rounds. Coincidentally all hosts won their games. Here is the last round review presented by ESL. An exciting game between Top Four teams was played in Jakarta. First ranked NSH faced 3rd ranked Siliwangi. Host NSH (9-5) smashed guests from Bandung (5-8) 82-63. The game was mostly controlled by NSH. Siliwangi managed to win third quarter 17-11. But it was not enough to take a lead and get a victory that evening. NSH forced 19 Siliwangi turnovers. They looked well-organized offensively handing out 21 assists. The best player for the winners was American power forward Anthony Simpson (202-87, college: Kent St.) who had a double-double by scoring 20 points, 11 rebounds, 4 assists and 4 steals. The other American import guard Dashaun Wiggins (188-91, college: Portland St.) chipped in 10 points, 8 rebounds and 7 assists. At the other side the best for losing team was American forward Michael Vigilance (203-94, college: Clark Atlanta) who recorded a double-double by scoring 15 points and 14 rebounds. Both coaches used bench players which allowed the starters a little rest for the next games. NSH maintains first position with 9-5 record. Siliwangi at the other side keeps the third place with eight games lost. NSH are looking forward to face Hang Tuah (#4) in Pandang in the next round. Siliwangi will play on the road against Pacific Caesar in Surabaya and it may be a tough game between close rivals. An exciting game between Top Four teams was played in Pandang. Fourth ranked Hang Tuah faced their close opponent Pacific Caesar. Host Hang Tuah (6-7) defeated guests from Surabaya (4-9) 83-76. It was a good game for American guard Gary Jacobs (188-92, college: Cent.Washington) who led his team to a victory with a double-double by scoring 36 points (!!!) and 11 rebounds. Abraham Wenas contributed with 11 points and 6 assists (went 7 for 7 at the free throw line) for the winners. American forward Qarraan Calhoun (203-86, college: Houston) replied with a double-double by scoring 24 points and 11 rebounds for Pacific Caesar. Hang Tuah maintains fourth position with 6-7 record which they share with defeated Pacific Caesar. Pacific Caesar lost third consecutive game. They keep the fourth place with nine games lost. Hang Tuah will play against league's leader NSH in Jakarta in the next round and it may be the game of the week. Pacific Caesar will play at home against Siliwangi and it may be a tough game between close rivals. In the last game of round 18 Satya Wacana was defeated by Satria Muda in Jakarta 88-80. An exciting game between Top Four teams was played in Jakarta. First ranked NSH faced 3rd ranked Siliwangi. Host NSH (9-5) smashed guests from Bandung (5-8) 82-63. The game was mostly controlled by NSH. Siliwangi managed to win third quarter 17-11. But it was not enough to take a lead and get a victory that evening. 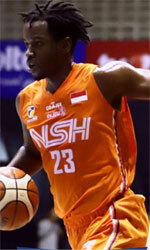 NSH forced 19 Siliwangi turnovers. They looked well-organized offensively handing out 21 assists. The best player for the winners was American power forward Anthony Simpson (202-87, college: Kent St.) who had a double-double by scoring 20 points, 11 rebounds, 4 assists and 4 steals. The other American import guard Dashaun Wiggins (188-91, college: Portland St.) chipped in 10 points, 8 rebounds and 7 assists. Four NSH players scored in double figures. At the other side the best for losing team was American forward Michael Vigilance (203-94, college: Clark Atlanta) who recorded a double-double by scoring 15 points and 14 rebounds and Daniel Wenas (188-92) added 7 points respectively. Both coaches used bench players which allowed the starters a little rest for the next games. NSH maintains first position with 9-5 record. Siliwangi at the other side keeps the third place with eight games lost. NSH are looking forward to face Hang Tuah (#4) in Pandang in the next round. Siliwangi will play on the road against Pacific Caesar in Surabaya and it may be a tough game between close rivals. There was no surprise in Jakarta where 5th ranked Satya Wacana (4-10) was defeated by third ranked Satria Muda (7-6) 88-80. Satria Muda dominated down low during the game scoring 54 of its points in the paint compared to Satya Wacana's 32. Their players were unselfish on offense dishing 26 assists. It was a good game for American forward Dior Lowhorn (201-87, college: USF) who led his team to a victory with a double-double by scoring 33 points (!!!) and 16 rebounds. International forward Jamarr Johnson (193-88, college: Widener) contributed with 19 points, 6 rebounds and 4 assists for the winners. Four Satria Muda players scored in double figures. Satria Muda's coach allowed to play the deep bench players saving starting five for next games. American guard Madarious Gibbs (185-93, college: Texas Southern) replied with a double-double by scoring 41 points (!!! ), 6 rebounds and 10 assists and his fellow American import forward Raymond Miller (204-88, college: CS Fullerton) added 17 points, 11 rebounds and 4 blocks in the effort for Satya Wacana. Satria Muda have a solid three-game winning streak. Defending champion moved-up to second place, which they share with Bima Perkasa. Satya Wacana at the other side keeps the fifth position with ten games lost. Satria Muda will play against Bima Perkasa (#3) in Sakti in the next round, which may be the game of the day. Satya Wacana will play at home against the league's second-placed Pelita Jaya and hopes to get back on the winning track. An exciting game between Top Four teams was played in Pandang. Fourth ranked Hang Tuah faced their close opponent Pacific Caesar. Host Hang Tuah (6-7) defeated guests from Surabaya (4-9) 83-76. It was a good game for American guard Gary Jacobs (188-92, college: Cent.Washington) who led his team to a victory with a double-double by scoring 36 points (!!!) and 11 rebounds. Guard Abraham Wenas (175-96) contributed with 11 points and 6 assists (went 7 for 7 at the free throw line) for the winners. Jacobs is a former Eurobasket Summer League player, which is considered top international summer league in the market. Four Hang Tuah players scored in double figures. American forward Qarraan Calhoun (203-86, college: Houston) replied with a double-double by scoring 24 points and 11 rebounds and Muhammad Hardian (189-93) added 22 points and 7 rebounds in the effort for Pacific Caesar. Hang Tuah maintains fourth position with 6-7 record which they share with defeated Pacific Caesar. Pacific Caesar lost third consecutive game. They keep the fourth place with nine games lost. Hang Tuah will play against league's leader NSH in Jakarta in the next round and it may be the game of the week. Pacific Caesar will play at home against Siliwangi and it may be a tough game between close rivals.